Jesus wants to eat with us. Let me say that again. The Triune God of the cosmos not only created the world and humanity but desires fellowship, communion, and friendship. And when sin entered the world and humanity to wreak havoc and choas, God intervened again – with the redemptive mission of restoring Shalom – all that which God intended for us. Throughout Jesus’ journey, he was eating with men, women, and children. He ate with tax collectors, prostitutes, sinners, Romans, Gentiles, and even religious folks. When you understand the significant cultural and spiritual meaning behind “eating together,” I completely understand why the religious folk couldn’t “get” Jesus. Eating together = lifelong friendship. 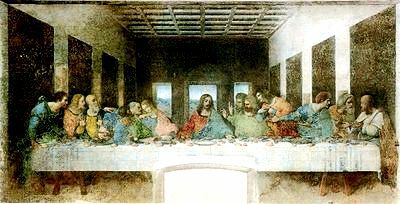 Even during the Last Supper – in the presence of Judas who will betray Jesus for 30 sickly silver coins and with other disciples arguing and jockeying for position and power – all Jesus wants is to eat with them. God/Jesus/Holy Spirit wants to be eternal communion and friendship with us. He creates it, pursues it, and ultimately sends his Son to restore, redeem and reconcile that Relationship – as the perfect Sacrifice. Truly amazing. And so, I encourage you: Eat with Jesus. If you’re interested, one of our community groups at Quest Church is hosting a Passover Seder meal on Thursday from 6.30-8.30pm at the church basement. You’ll need to RSVP at office@seattlequst.org if you’re interested. Next resurrection people – he has risen! Don’t forget the significant “Jewishness” of this Passover meal. This has many implications for the richness and depth of meaning that this ritual meal represents (freedom from captivity, God’s deliverance of His people, remembrance and reminding, and understanding of being a people “set apart”- holy unto the Lord.) Jesus didn’t simply “just want to eat” with them- they were performing a sacred Jewish festival commanded by Yahweh, and Jesus was showing his disciples that HE was the sacrifical lamb, instating a new covenant- His blood would be on the doorposts for them now. Not trying to be a stickler- what you said is beautiful- just wanting to remind us that there is a larger context here that would benefit us to remember and ponder. If you’ve never been to a Messianic Jewish Seder meal, I recommend it. It is one of the most enriching and awesome Easter experiences I’ve ever had. Well written Eugene. Thanks for sharing the simple nature of the gospel. Beautiful post. Thank you, Eugene. I always thought that we Southerners were the only ones who appreciated the importance of food and fellowship, but judging by that picture, you guys could give us run for our money! A great book that made me think more seriously about the importance of sharing food/ the Lord’s Supper was “Take This Bread” by Sara Miles. She raises some good questions, including: should we share communion with believers as well as non-believers? I am SO JEALOUS of the amazing-looking Asian food you’re serving up in that picture. Church events here in Texas usually mean fried chicken or barbeque. Not that that’s bad… but I would … well… I would do a lot to get a good spread of Asian cuisine! oh snap! is that fresh lumpia in the right corner?! That spread looks awesome, Eugene!